This is Our Story - Charlie's & Co.
Charlie’s & Co. is a leading catering company which delivers first class food, designed around your needs. Our catering services are the perfect blend of delicious food, creative ideas and professional staff. From corporate caterings for client entertaining, contract catering for staff lunches, Christmas parties and in house office catering to special occasions such as weddings, engagement parties, and personal celebrations… combine this with our inspirational event management team and you have the complete package for a successful event.  Let Charlie's cater your next function, just call and let us take care of the rest. From Weddings to Hoe-Down's let us do the cooking. There are different packages available so let us know about your special occasion. Below gives you an idea of what we have to offer. Give us a call or come by and try some of the best Bar-B-Que in town. Mesquite grilled Beef and Chicken Fajitas is just one of the wide variety of menu selections we have to offer. Restaurant also available for private bookings up to 200 people.